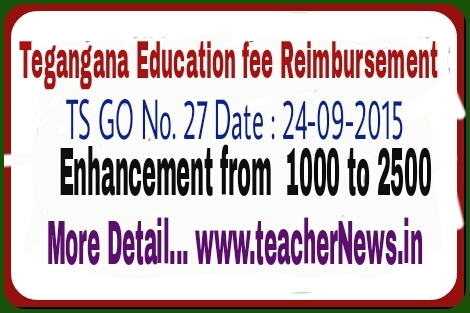 PRC recommendations of the Ninth Pay Revision Commission, 2010, orders were issued enhancing reimbursement of tuition fees from Rs.400/- to Rs.1000/- per annum, per pupil, to the children, not exceeding two, of Non-Gazetted Officers and Class-IV employees studying in all the classes from LKG to Intermediate / 12th Class, vide reference first read above. 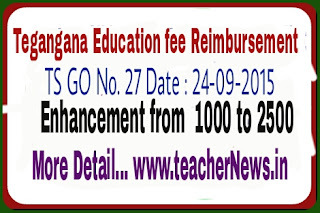 Tegangana Government, after careful examination of the matter, and the recommendations of the Tenth Pay Revision Commission, 2015, hereby enhance the reimbursement of tuition fees from Rs.1000/- to Rs.2500/- (Rupees Two Thousand and Five Hundred Only) per annum, per pupil, to the children not exceeding two of all the Class-IV employees and Non-Gazetted officers studying in all the classes from LKG. upto and inclusive of the Intermediate / 12th Class, subject to the other usual conditions regarding the submission of receipts, certificate, etc., as per the existing Rules and Regulations, from the present Academic Year of 2015-2016.